Using an apple corer (if you don't have one, play around carefully with a knife), remove the core of the apple leaving the bottom of the apple intact - don't cut all the way through. Once you have this starting hole, take your knife and cut a "bowl" out of the top of the apple. To shallow out the inside a little, use a spoon to scrape at the edges. Don't remove all of the inside - just enough for filling. 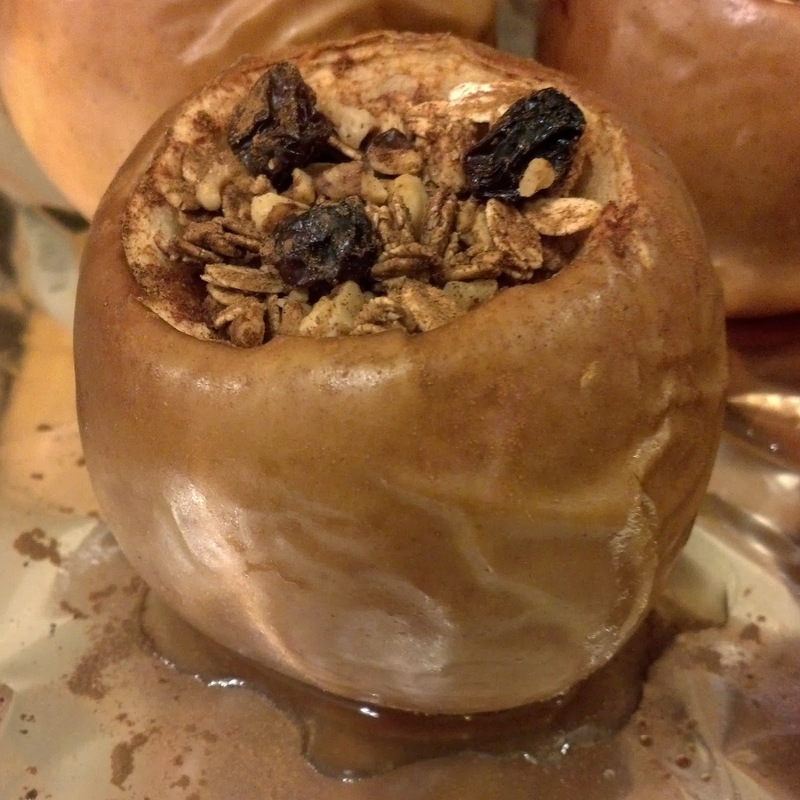 Sprinkle the inside of the apple with cinnamon, lightly coating all of the apple flesh. For the filling, combine the oats, walnuts, raisins, maple syrup, and spice with cinnamon to your liking (you can be quite generous with the cinnamon!) in a bowl. Sprinkle a tiny amount of water or almond milk, lightly moistening the oats. Once the filling is all mixed evenly together, the cinnamon sticking, to the other ingredients, stuff the filling into the apple. Sprinkle a little more cinnamon on top, and then place the apple on a baking sheet and put it in the oven. Bake the apple for about 45 minutes, or until the apple skin feels soft and squishy when you poke it and juice begins running out of the apple.